Many people laughed when Tim Tebow chose to pursue baseball. They said he had no chance of being a productive player and was simply orchestrating a PR stunt to stay in the spotlight after the end of his NFL career. But Tebow just did something that might’ve shut up the haters once and for all. Tim Tebow endured a lot of abuse as an NFL player. People criticized his unorthodox throwing motion, his child-like enthusiasm, and his devotion to Christianity. Opposing players mocked his gesture of kneeling to give glory to God, and the mainstream media were just as savage in their attacks on him. They cheered with glee when his NFL career fizzled, and they were waiting to dance on his baseball dreams when he announced the decision to shift sports. Tebow started to play well. After a rocky start, Tebow began to show the promise he had as a high school multi-sport star. He showed steady improvement and received a promotion to Binghamton Rumble Ponies, the New York Mets’ double-A affiliate. Now in his second season with the Rumble Ponies, Tebow got off to an inauspicious start to the season. He injured his ankle in spring training after stepping on a sprinklerhead and struggled to find his groove. But since then, Tebow has been on a tear. He’s hitting .318 for the month of June, and raised his season average .261 with 5 homeruns. He’s also been a reliable glove in the outfield. Last year Tebow got put on the all-star ballot despite not playing at that level. 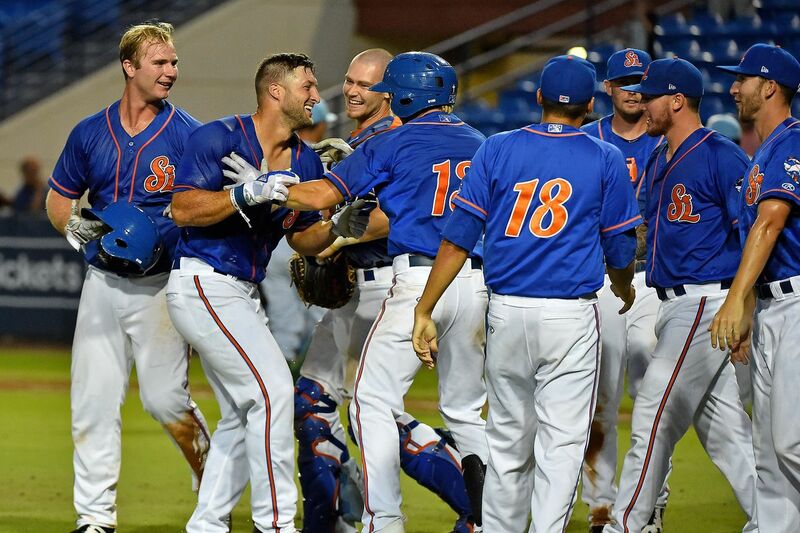 But this year, Tebow officially made the team Eastern League All-Star Team, and his selection was well-deserved. For a guy who was considered too old at 30 and destined to wash out quickly, making the all-star game is a huge accomplishment. Opposing teams have taken notice of Tebow’s rapid improvement. Tebow’s rapid improvement suggests that his goal of reaching the majors isn’t far-fetched at all. Mets general manager Sandy Alderson said he expected Tebow to play in the majors one day, and his performance is making his general manager look good. Tebow would obviously be old for a rookie, but he certainly wouldn’t be the oldest in baseball history. Disney made a movie about pitcher Jim Morris, who made the majors at 35-years-old after a 12-year hiatus. If Tebow continues his ascension, Disney could be making a film about him. Despite the media circus that surrounds him, Tebow has kept a level head, and simply puts his head down and does the work. The all-star game selection is merely the latest testament to his renowned work ethic and grit. The game is set to be played July 11th at Arm & Hammer Park in Trenton, New Jersey. Tebow has risen to the occasion many times in big moments, so fans could be in for a treat.